The Nintendo Super System is shaping the future. High-tech control modules, specifically engineered for coin-operated use, have tremendous appeal to today's players and offer the most advanced game play in the industry. Thunderous stereo speakers and a huge, bigger-than-ever 25" monitor provides greater true-to-life action and loads of excitement. The Nintendo Super System is the arcade equivilant of the Super Nintendo System home console. 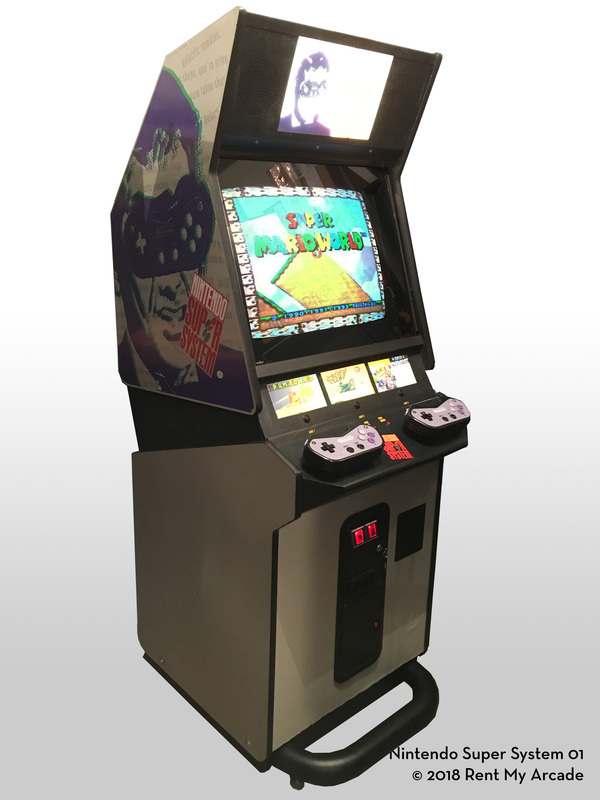 The player can choose one of three classic SNES games and play them on oversized SNES joysticks. Please select up to three games from the following list. A long time ago, a peaceful land was overrun by monstrosities. You are the strong-sworded champion who can restore order by cleansing your land of foul creatures. But look sharp! They can be fast and tricky, or big and strong. All sorts of traps await you. You are one lone hero battling against all the power of an evil empire. Charge ahead and challenge your skills. This action-packed game will push you to the edge of your abilities. It's the ultimate race of the 26th century. Choose one of four high-speed hovercrafts and race at blinding speeds against maniacs out to win at all costs. Racing never looked or sounded more real, or felt more dangerous. NCAA Basketball has unique over-the-shoulder perspective that puts you in the game like never before! Choose your team from five of the top NCAA basketball conferences and lead it through the grueling tournament to a berth in the Final Four and a national championship! Or, challenge a friend to a head-to-head exhibition game. Super Mario Kart is all about racing for the checkered flag through a variety of cartoonish landscapes inspired by the Mario universe. You pick your character from a selection of eight Mario mascots, including the man himself, his brother Luigi, Princess Peach, Toad, Yoshi, the grand and villainous King Bowser Koopa, Donkey Kong Jr. and a common Koopa Troopa. You then choose your engine speed from 50, 100 or 150cc (roughly equivalent to an Easy, Normal and Hard difficulty setting) and try to take home the gold after completing a circuit of several sequential races against all the others, who are trying to knock you out of the running with off-the-wall weapons like Koopa shells and banana peels. Championship action, fantastic play control and a unique field perspective let you really feel the power of the offense and the pressure of the defense. You control the man on the ball so the excitement never stops. Choose one of 16 international teams, pick your formations and battle opponents in exhibition or tournament play. Compete against a friend or challenge the computer. Tied at the end? Go to a shootout, winner takes all! Singles or doubles. Hard, clay or grass courts. Overhead slams, groundstrokes, backspins or lobs. You're in control in this World-Class competition, and mastering your skills will take practice. Work hard and score aces against the best pros. H: 75", W: 30", D: 36"